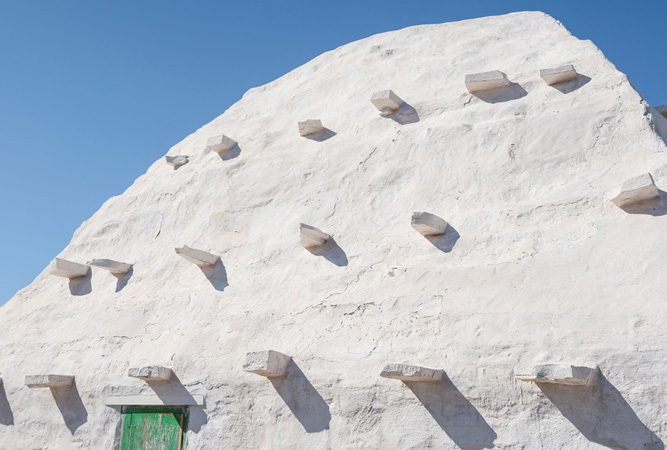 Few people know that in South Africa’s hinterland – on farms neighbouring the towns of Carnarvon, Williston, Loxton and Fraserburg – are a series of strange-looking beehive stone structures. They’re an anomaly of the Northern Cape Karoo; excellent examples of the inventiveness of early pioneers (trek boere) to this semi-desert landscape, known as ‘hard man’s Karoo’, who headed out here between the middle and the end of the nineteenth century into the barren area beyond the Sak River. They left to escape the restraints of government or to search for new grazing grounds for their livestock. Departing the boundaries of the colony they arrived in a region visited by relatively few even today. Without wooden trusses people made use of an ancient building method known as corbelling – the placement of successive layers of flat stone, each layer extending a little further inward than the layer before, until the walls eventually meet at an opening. One could then close this aperture with a single slab of stone. It seldom rains out here anyway, and the obvious benefit of being able to build a fire inside the structure or being able to see the stars from the relative safety of ‘indoors’ is obvious. Lying beneath one of these corbelled domes – its stepped-slate slightly disorienting for its upside down inner-waterwell sensation – in the relative comfort of a soft bed, my head cushioned on feather pillows it is not difficult to imagine the austerity of the lifestyle in the 1800s. The cold that is typical of this region of extremes – the scorching heat and bitter cold – does much to enhance my imagination. I’m lying under several blankets and a heavy duvet, whilst the rest of the country is already stripping off to embrace summer. 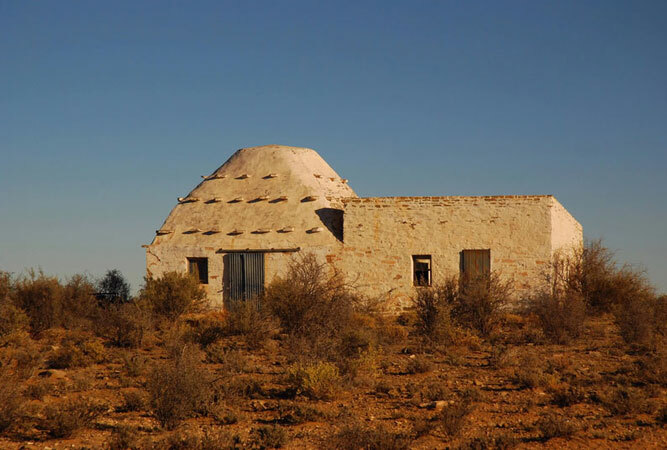 In similar style to those days, the corbelled house we stay in – one of few remaining corbelled structures in which one can overnight, on the farm Osfontein, just south of Loxton – has no lights. And whilst there is electricity for the convenience of a fridge and stove, and a new shower room with hot running water, the awkwardness of having to fill a tub to wash the dishes, squint to see clearly at night, and constantly duck one’s head when entering and exiting a room because the doorways are so low, is a sharp reminder of how easy we’ve got it today. Besides, there’s something incredibly attractive about taking the time to do basic things. Time slows, and even in the space of one evening, I’m beginning to intensely enjoy the crackle of the fire in the fireplace just outside the front door, the stars overhead so sharply beautiful, and so vast, they bring tears to my eyes. Around us is only the dark of the night. And the family sheep dog come to visit, his body across the length of the front doorstep in much the way, I imagine, farm dogs would have lain back then. With images of myself in a cotton bonnet and the imagined rigours of washing clothes by hand, we fall into bed to sleep one of the soundest sleeps ever. No street light creeps in under the curtain, no cars sweep past and even the roosters forget to crow until well into the morning. In our crypt-like abode we wake with the morning light. Corbelled dwellings, we discover whilst leafing through information about these initial farm dwellings the following morning, take both circular and rectangular form. We pour over a map that shows the location of all that remains of corbelled structures – not all of them as beautifully restored as Osfontein. After a while the farms begin to take on a theme – almost all of them end in the word ‘fontein’ (fountain) – Groenfontein, Modderfontein, Brandfontein, Banksfontein, Arbeidersfontein – and if not, then it’s ‘braak’ or ‘drift’, words indicative of the water that is the lifeblood of the Karoo. It seems that when the first farmers settled here, their initial homes were all single stone beehives, most of them twenty feet in internal diameter and twenty-four feet in height – mercifully cool during the scorching summers, and reasonably warm in winter. Their walls were two feet six inches thick at the base and rose almost vertically to a height of six to seven feet. From there they curved inwards in the beehive we know as corbelled houses. In the rectangular buildings, like those at Arbeidersfontein and Klipkolk, the walls are vertical for seven feet, before corbelling inwards, in similar ways to recorded houses in County Down, Ireland, the Hebrides, Spain and the Balearic Islands (an archipelago of Spain). These basic structures then evolved as the demands of a family grew. A second corbelled room was linked to the original, connected by a doorway (you can see this at Osfontein). Eventually several corbelled huts would link to form a dwelling. 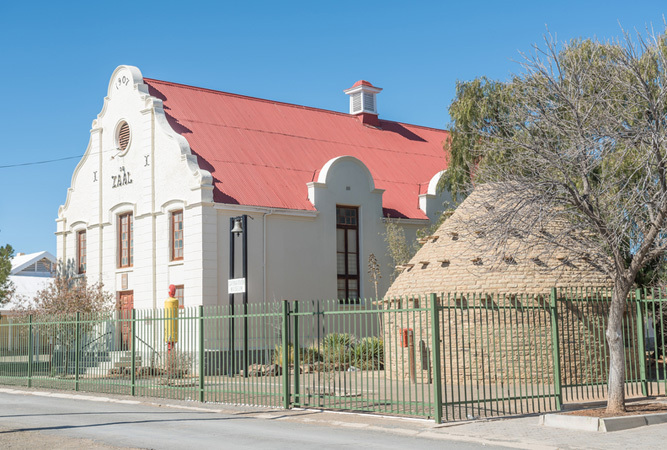 Some built brand new structures, using the original corbelled house as a storeroom (Osfontein has another far smaller corbelled structure close to the newer farmhouse). By the time we pack the car to leave, I am reluctant, having fallen under the charm of the characterful corbelled house. I could easily stay longer and simply sit on the stoep and stare out at the great Karoo landscape, the gentle hills in the distance, whilst the hens poek poek around my feet. Perhaps exciting is too demanding a word to describe the corbelled house. It might describe the lifestyle of the original settlers out here, but for me and other visitors like me its appeal lies in its intriguing ability to slow time and to bring one rapidly close to what really makes life important. 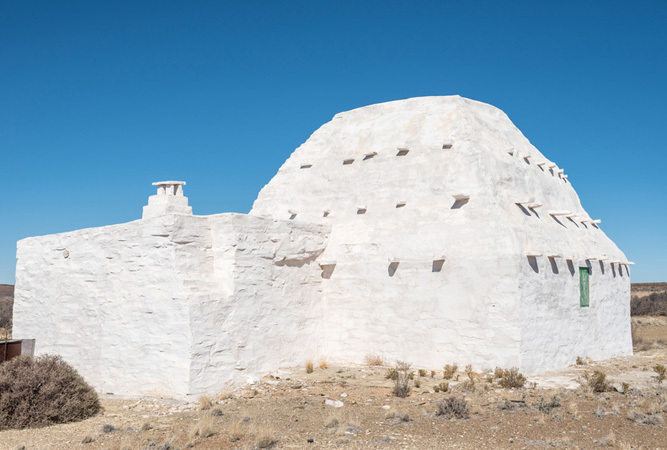 There are only about 40 well-preserved dwellings, a few of them visible from the road, two available in towns, and a couple available as accommodation. Most are on farms (almost all of them sheep farms) in the area. You will need to do your homework and contact the farms as they’re not readily accessible (someone has yet to design a Corbelled House Route!). 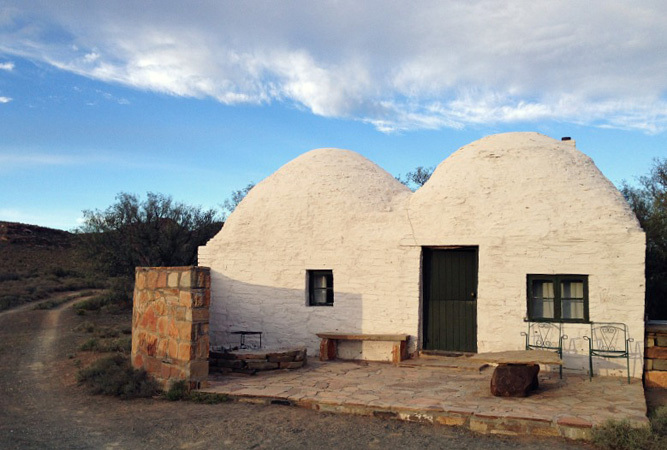 We recommend: The farm Osfontein is a beautiful example of a corbelled house. Farmers Stegmann and Natasha Lubbe warmly welcome visitors to self-cater.